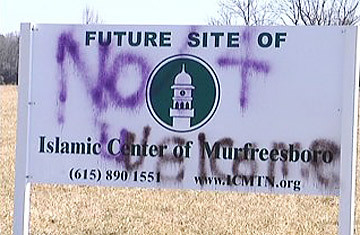 The proposed site of the Islamic Center of Murfreesboro's mosque in Murfreesboro, Tenn. When the congregation of Grace Baptist Church held services in its new building last month, no protesters marched outside to mark the occasion. It's doubtful that protesters will gather later this month when the church throws an all-day party to dedicate the new brick building on the corner of Bradyville Pike and Veals Road. The words "Not Welcome" will probably not be spray-painted on the new church's sign. The same cannot be said for the Islamic Center of Murfreesboro, which owns the neatly mown 15-acre field next to Grace Baptist and whose plans to build a mosque for its growing community has been caught in the net of anti-Islam sentiment in the U.S. Both of the signs the Center erected at the site of its future home were vandalized; the first had "not welcome" sprayed across it; the second was simply smashed in two. Since May when the Center gained building approval from Rutherford County, local Tea Party activists have aggressively fought to stop the mosque, staging protests, claiming that it was too big (inflating it from a modest 6,800 square feet to a whopping 53,000 square feet) and making it a campaign issue in recent elections. Republican Ron Ramsey, Tennessee's lieutenant governor and a gubernatorial candidate, gained national attention  and ridicule on The Colbert Report  after opining "you could even argue whether being a Muslim is actually a religion, or is it a nationality, a way of life or cult, whatever you want to call it?" While Republican congressional candidate Lou Ann Zelenik said the center is part of "a political movement designed to fracture the moral and political foundation of Middle Tennessee." Ramsey and Zelenik both lost their bids for Republican nominations. The protests were a complete surprise to members of the Islamic Center, says spokeswoman Camie Ayash. "It's still a little mind-boggling. It seems like the community is very accepting of us as individuals; when I take my kids to school, I don't run into any prejudice because I cover my hair, but the concept of Islam overall makes people nervous because of 9/11." The population of Murfreesboro is only about 100,000 and at first glance it wouldn't seem logical that a small city in the middle of the Bible belt could need a large mosque. But Murfreesboro is a scant 30 miles south of Nashville which at the end of the first war in Iraq was designated a gateway city for refugees, setting the stage for a rapidly growing Muslim population, and anti-Muslim sentiment. Last February the Al-Farooq Mosque in Nashville was vandalized, with graffiti  a cross and "Muslims go home" spray painted on its facade. Earlier this year, a white supremacist was sentenced to 183 months in prison for his role in the 2008 bombing of the Islamic Center of Columbia. Attempts to build new mosques in other nearby cities, including Brentwood and Antioch, have been stopped. For several years the Islamic Center of Murfreesboro has operated from a 2,200 sq. ft. office building in a neighborhood of mixed industrial and business use. But with a membership of 250 families  some 1,000 people  during Friday prayers, when the entire community gathers together, have become a problem. "There are literally people out in the parking lot because there's no room inside for everyone," says Ayash. Last May the Center was given county approval to build a 6,800 sq. ft. facility that will include a prayer hall and community room. Of the mega complex, including classrooms, that opponents refer to as a "maybe someday" dream of the Center's, Ayash says, "That's 10, 20, 30 years in the future." But if some people in Murfreesboro want the county to reject construction of the new mosque, they also wanted  and won  rejection of a proposed Bible theme park in the city. "It isn't about Islam or religion, it's about where they want to build," insists Kevin Fisher, an organizer of opposition to the mosque who says he also opposed the Bible park because developers wanted to build too close to a subdivision. Along with worries over increased traffic on a road he says is already too dangerous, Fisher says the Center's plans to one day have a cemetery could generate soil and water contamination. Ayash says that while one member of the Center is already buried on the property, without a coffin, "in accord with Islamic custom," it all took place with county and city approval and within health guidelines. Fisher says that's not good enough. "Each of my concerns is based on legitimate issues. This has nothing to do with anti-Islam; it's not racism. I'm African-American, I know what it's like to be discriminated against. I wouldn't do that to someone." Still, Fisher concedes he didn't object to the construction of the new Grace Baptist Church at the same corner. "That's a much smaller building [than the 52,000 feet complex the Center might one day build] and they don't plan a cemetery." While insisting he isn't anti-Islam, Fisher says he does question how construction of the mosque "promotes the general welfare" of the people, as outlined in the Bill of Rights. "I respect their rights to worhip as they see fit, but I'm not certain this promotes domestic tranquility." Russell Richardson, pastor of Grace Baptist, disagrees with Fisher. His "Pastor's Heart" page on the church's website includes the following advice: "The Heart of the change in a Christian's life from before to after salvation is love. Jesus said that we would be known to be His disciples by the love we have for each other. In fact, He commanded it. In Luke 13:34-35 Jesus told us that we were not allowed to be without love for other believers. Instead we were to love each other in the same way that He loved us. That is a far cry from the way we see Christians treating one another in churches today. Yet it is our love for one another that is supposed to distinguish us from people who are not followers of Christ. So if it can't be seen in our lives....You work it out. God bless you all." See pictures of spiritual healing around the world. See the top 10 Jesus films of all time.